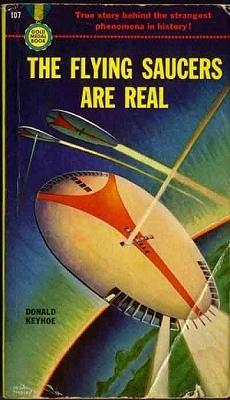 This was one of the first books published about the UFO phenomena. We are fortunate that it ended up in the public domain. It is a template for much of what would follow: the paranoia, the government disinformation, the inescapable conclusion that the saucers are not of this earth. Keyhoe, with his spare, matter of fact writing style, which also conveys a profound sense of wonder, has to be the prototype for the deadpan Fox Mulder of the X-Files. On one hand we can see the birth of a key modern mythology. On the other, there is a body of almost naive evidence in this text unpolluted by that very mythology. The case studies are real. The witnesses were highly reliable. These cases are still unexplained.